Copyright © 2007 by the Editors of Working on the Moon. Last revised 23 August 2007. As described in greater detail in the Apollo 17 PLSS/OPS/BSLSS briefing, the OPS provides "an independent, backup life support capability. It provides oxygen for respiration, pressure control, and cooling." When operational, the OPS "regulates at 3.70 ± 0.30 psid (0.255 ± 0.021 bar)". The OPS is activated by moving a lever on the OPS cable attached to the side of the chest-mounted Remote Control Unit (RCU). a. Low Flow: used if cooling is avaliable from the PLSS or from the other astronaut's PLSS through use the the Buddy Secondary Life Support System (BSLSS). 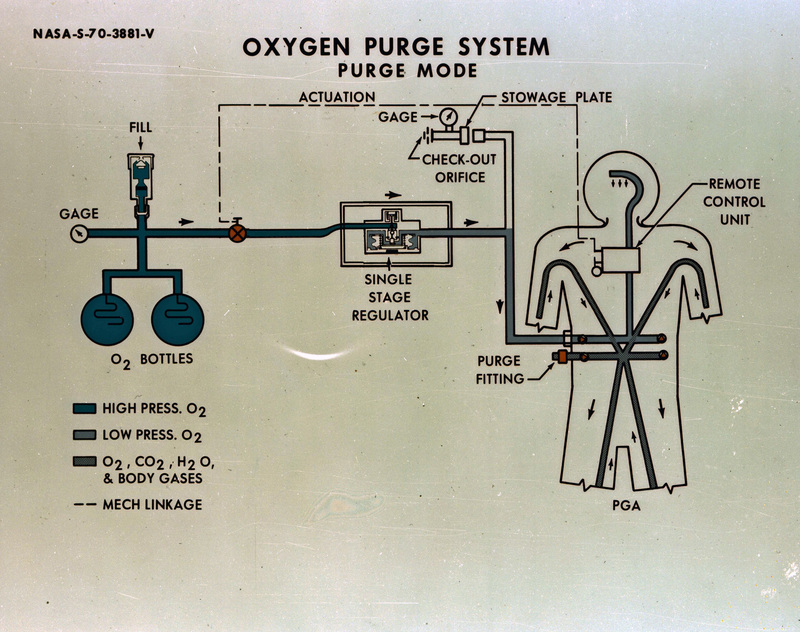 As indicated in Section 4.4, "Travserse Planning Parameters" in the Apollo 17 Final Lunar Surface Procedures volume, the two oxygen bottles carried a total of 5.34 lb (2.42 kg) of useable oxygen and had a lifetime of 79.5 minutes. The implied flow rate is 3.81 lb/hr (1.73 kg/hr) rather than the notional rate of 4 lb/hr given in the A17 briefing. b. High Flow: used when the OPS must provide both oxygen for breathing and for cooling. As indicated in the A17 Traverse Planning pages, the useable oxygen charge under high-flow conditions was 5.04 lb, (2.29 kg), the lifetime 39 minutes, and the implied flow rate 7.75 lb/hr (3.52 kg/hr). The notional flow rate is 8 lb/hr. None of the OPS's flown during Apollo were actually used, but a checkout was performed on each OPS before each EVA and before PLSS jettison. The essential elements of the checkout were readouts of source pressure and of the regulated pressure. The source pressure was reported to Houston. The status of the heater that kept the oxygen regulator warm was also checked. The heater system was eliminated for flights after Apollo 13. Details of the checkout procedures can be found in Sections 4.2 and 4.9 in Volume II of the Apollo 12-15 EMU Handbook and, for later flights, in Section 4.2.1 of Volume II of the Apollo 15-17 EMU Handbook. 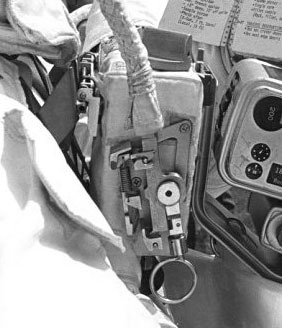 On three occassions during the first Apollo 16 EVA, John Young's purge valve pull-pin came out when he was getting on or off the Rover, probably catching either the Red Apple or connecting lanyard on his seat belt. 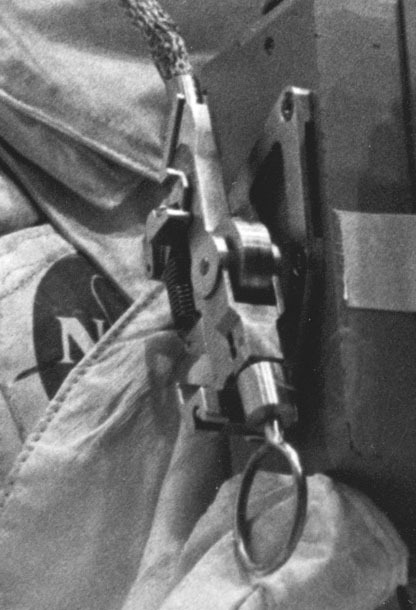 Charlie Duke solved the problem for EVAs 2 and 3 by suggesting that they install the purge valve with the Red Apple just under John's camera handle, rather than at the top of his leg. 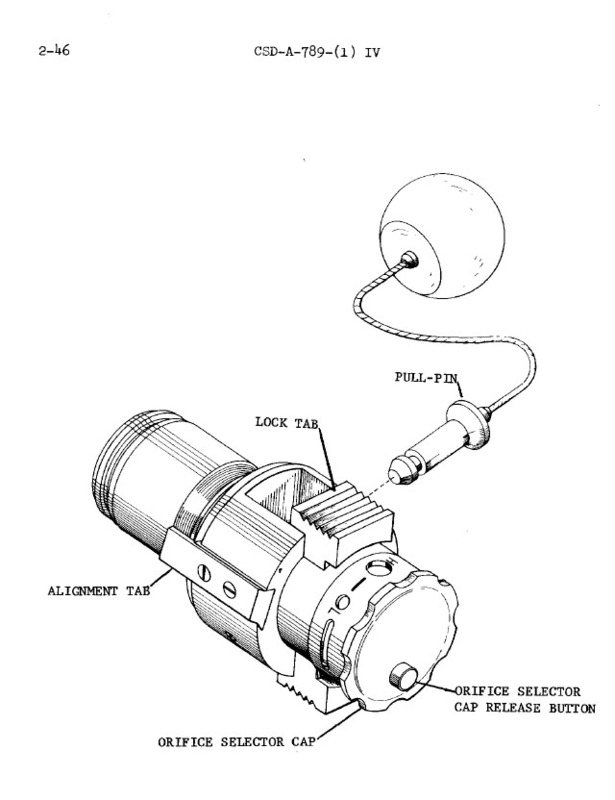 According to the Apollo 16 Mission Report, a "modification has been made (for Apollo 17) to eliminate the barrel actuator spring in the purge valve and to shorten and stiffen the pin assembly lanyard. This modification will require manual pull-out of the purge valve barrel, and will prove less chance of the red apple and lanyard being snagged." In answer to a question during a mission review done for the ALSJ in the early 1990s, Charlie recalled that, "the pin was just a safety, like most all pins. You pulled the pin out and then you had to make an action of turning it (meaning the purge valve) or pulling it - I've forgotten. You had to take a distinct action; but I suppose there was a possibility of brushing up against something and you could twist it or pop it and you could start flowing (oxygen) out. Your suit would make it up, but you'd be using quantity out real fast and it would shorten the EVA. So I asked John to check his EMU and make sure the purge valve wasn't popped open and he wasn't losing O2." 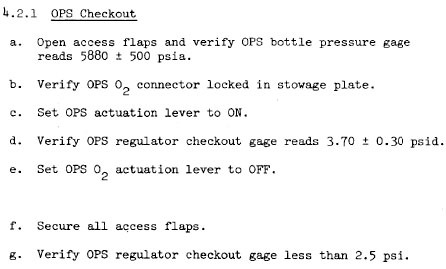 During Apollo 17, Jack Schmitt reported that checkout of the two OPSs consistently showed output regulator pressures close to the upper end of the range of acceptable values. Because the readings did not change significantly across the sequence of checkouts, no action was taken. Nor was the issue discussed in the Apollo 17 Mission Report. "At some point there had been a suggestion that we would have to stay close enough to the LM that we could get back in the case of a double failure of both the Rover and a suit. I didn't like that and, obviously, we (the Astronaut Corps) ended up winning the argument. There were lots of things you could do to share oxygen. Suppose that Jack's PLSS failed and he had to go on his OPS. The first thing I'm going to do is take my OPS off my suit and put it in his lap. Then I wouldn't have an emergency supply but he'd have two. I don't think that was ever written down anywhere, but if that had happened, he'd have had an hour of OPS oxygen (in high flow, two hours in low flow) and we would have been headed for home (the LM). That's the kind of thinking that went on." Apollo 17 Final Lunar Surface Procedures,Section 4.4, "Traverse Planning Parameters", pages 293-301. Apollo Operations Handbook Extravehicular Mobility Unit, Vol. I, System Description, CSD-A-789-(1), Apollo 14, Revision IV, June 1970. Apollo Operations Handbook, Extravehicular Mobility Unit, Vol. I, System Description, CSD-A-789-(1), Apollo 15-17, Revision V, March 1971. Apollo Operations Handbook Extravehicular Mobility Unit, Vol. II, Operational Procedures, CSD-A-789-(2), Missions 12 through 15, Revision I, Oct. 1969. Apollo Operations Handbook, Extravehicular Mobility Unit, Vol. II, Operational Procedures, CSD-A-789-(2), Apollo 15-17, Revision II, June 1971. Apollo PLSS/OPS Images : Full-Scale PLSS/OPS Engineering Model at NASA Johnson; PLSS/OPS Display Unit at the National Air and Space Museum. The OPS is activated by moving the Actuator lever from the OFF position to the ON position and locking it. The OPS can be deactivated by reversing that procedure. 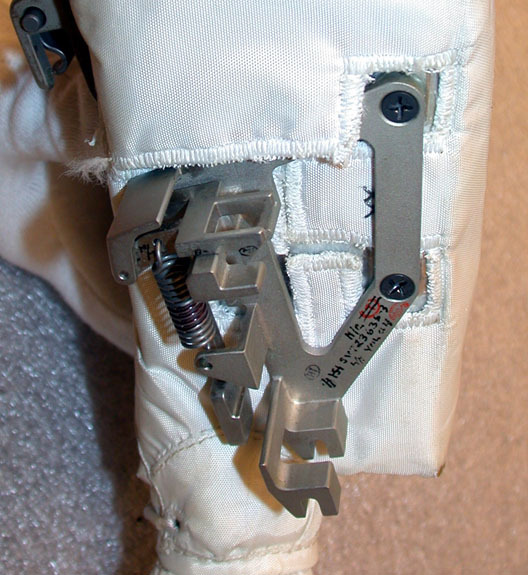 The lever is mounted in a bracket on the (astronaut's) right side of the chest-mounted RCU. attached to the chest-mounted Remote Control Unit (RCU). The lever had a ring on the end, making grasping it easier. Detail from Apollo 17 photo AS17-134-20385 of Gene Cernan. Garber Facility by Ulrich Lotzmann and Amanda Young. Side view of an installed OPS Actuator. from Apollo 15 training photo 71-H-1123. Section 2.2.5.10 in the Apollo 14 EMU Handbook, Vol. 1 - "The purge valve (fig. 1-29, below) is inserted in the red, unused outlet gas connector during EVA. The purge valve has two positions, low flow and high flow, which may be changed during a purge if conditions require it. The low flow position flows 4.0 ± 0.2 ib/hr of O2 at 4.0 psia PGA (Pressure Garment Assembly) pressure during the purge operation. This provides adequate CO2 washout when additional cooling is not required. The high flow position flows 8.1 ± 0.3 lb/hr of O2 at 4.0 psia PGA pressure during the purge operation if CO2 washout and additional metabolic cooling is required. To change positions, the small button on the face of the valve is depressed and the knurled portion of the valve is rotated to the position desired. The valve is activated by removing the additional locking pin and depressing the two activation tabs. The order of the two steps is not critical. To shut off purge flow, the valve can be removed from the gas connector or the center barrel can be depressed and the locking pin reinserted." 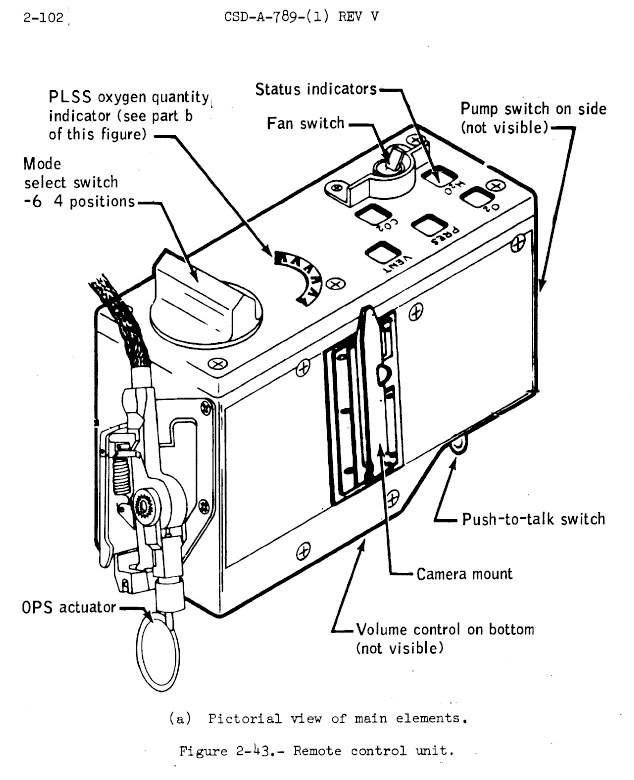 Figure I-29 from the Apollo 14 EMU Handbook, Vol. 1.
was colored bright red and was called the 'Red Apple'. Lunar photographs of Buzz Aldrin's purge valve (left) and Al Bean's (center). The image on the right shows a purge valve installed on John Young's training suit. Extended discussion with Ed about using the OPS in make-up mode. Once the crew was back in the LM and had the cabin pressurized, they could use the purge valves to speed depressurization of the suits. Cernan - "In addition to giving us an emergency oxygen supply in case we'd lost integrity on one of the suits, the Oxygen Purge System also gave us another emergency capability. After the third EVA, we threw the PLSSs out of the LM but kept the OPSs so that, at rendezvous, in case we couldn't dock, we could use the OPSs to do an emergency transfer-EVA into the Command Module. We could plug the OPS in directly to the belly of the suit and stay pressurized for 30 minutes, long enough to get into the Command Module had we had a docking problem." OPS checkouts were done before each of the EVAs and before the pre-launch PLSS jettison. If either of the OPSs had failed its checkout, they would have kept a PLSS in case they had to do an EVA transfer to the CM. Houston wants to make sure Al and Ed take the '100-foot' tether up to the cabin in case they have to do an EVA transfer to the Command Module. Because of docking problems experienced early in the mission, Houston believed there was a greater-than-normal chance of an EVA transfer. Mention by Dave Scott of time spend as part of the Apollo 9 crew developing procedures for EVA transfer from the LM to the CM. During EVA-1 preps, as per checklist, Jim gets his purge valve and verifies that it is closed and in low flow before handing it to Dave for installation. Dave checks his own at 119:19:16, before Jim installs it. After EVA-1, Jim comments on how dirty his purge valve is. After EVA-2, Dave has trouble removing his purge valve. "'Kind a stuck' it is. Guess we got a little dirt in here. Guess we'll have to work on that later." Gene Cernan mentions a dirty purge valve after Apollo 17 EVA-2. Jack reports "Both (OPS) regulators are reading slightly under 4.0 (pounds per square inch or psi)." The expected range is 0.370 ± 0.30 psi. Jack is alerting Houston that both OPS readings are near the edge of the range. 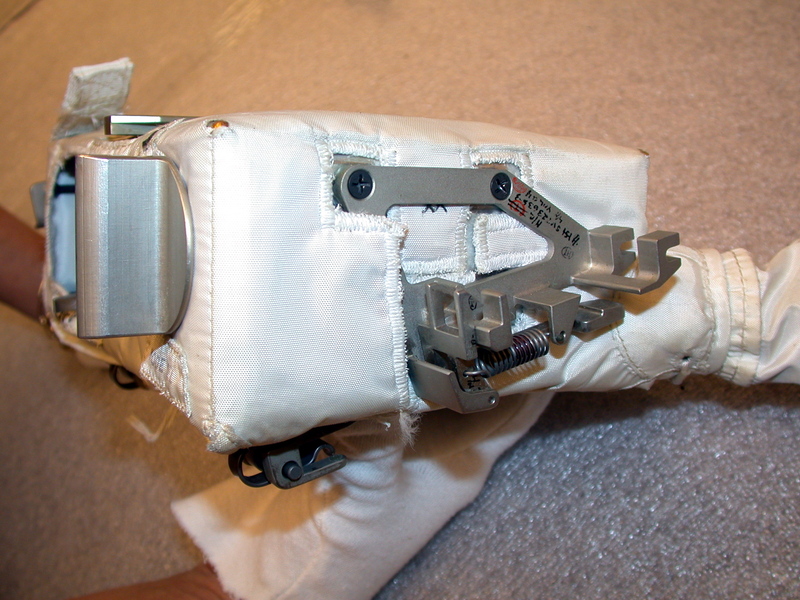 While installing Buzz's purge valve, Neil rotates it in the connector to position the Red Apple so that Buzz could grasp it easily. At the start of the drive to Station 2, Bob reminds them that we're under a 63-minute limit to get you from the LM out to the Station 2 because of OPS drive-back. So, keep us informed so we can keep a good tab." As they are approaching Station 2 at 142:39:51, Bob lets them know that they need to arrive within the next 5 minutes. Using the Buddy Secondary Life Support System (BSLSS) to share cooling water and using an OPS in low-flow, they have a 79.5 OPS lifetime. Margins are discussed in the chapter on Emergency Return to the LM. While Charlie works around the Rover at the ALSEP site, he finds John's purge valve pin on the ground next to the CDR's seat. It must have come out when John got off the Rover. Charlie puts it under John's seat, probably intending to install it before they leave. About a minute later, Houston asks Charlie to install the pin before he gets back to his ALSEP tasks. Video of Charlie doing the installation at 122:25:42. John's pin comes out for the second time as he is getting seated at the end of their brief stop at Halfway Crater. John's pin comes out again while he's getting off the Rover at Station 2. Later, just as they are about to leave Station 2, Tony asks Charlie to make sure John's pin is still in. It is. During the EVA-1 debriefing, Tony tells them that people are thinking about the problem of John's purge valve pin coming out but adds, "I wasn't sure you had a problem." John replies, "I don't think we've got a problem, either, if I can figure a way to keep (from) pulling it every time I get in and out of the Rover. If I can't do that, why, we'll just keep putting it back in." 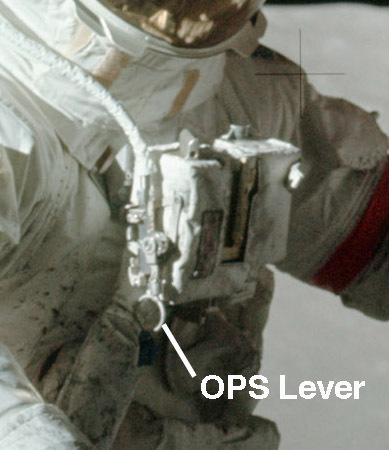 In an extract from the Apollo 16 Technical Crew Debriefing, John says that, during EVA-2 prep, they turned the purge valve so that the pull-pin and Red Apple was pointing away from his naval. During the suit integrity check, he made sure he could reach the Red Apple, which he could. There were no further problems. Post-mission testing confirmed Charlie's suspicion that John was catching either the red apple or lanyard on his seatbelt while he was getting off the Rover. Photo AS16-114-18388 shows the position of John's Red Apple during EVA-1, just above his right leg; AS16-117-18825 shows it during EVA-3, just below his camera, peeking out behind the sample bags. During EVA-2 preps, Tony England passes along a suggestion that John use something as a lanyard to secure his Red Apple to a fitting on the front of his suit. John doesn't think much of the idea and ends up not doing anything other than re-positioning the Red Apple. Based on Tony's conversation with the crew during the EVA-1 debriefing and his emphasis that they do 'whatever you think's necessary, he doesn't think much of the idea, either. The Red Apple was easy to spot if the pin did come out.